On my first day in India, my aim for the day was to get my bearings. I wanted to figure out Cochin, the historic trading port in Kerala, which was my first stop. I would study road names and monuments and landmarks that would help me find my way home. I also wanted to log information about how people in the street behaved and how the traffic worked. My first day would involve observation. I would dip my toe in, so to speak, before diving in. I walked around town, diligently observing. I waved off auto rickshaw drivers. I stayed out of the museums and shops. After returning to my homestay in the afternoon, desperately ready for a nap, I reflected on how observing is useful but awfully boring. After my day of reconnaissance I would dive in first thing tomorrow: ‘I will just say okay to whatever comes my way’. I’d been pre-warned about this. While auto rickshaw drivers get a commission on your purchases, there is also an incentive just to get you in the door. One tourist delivered to a shop for two minutes of browsing will, at the very least, earn a small petrol voucher. ‘I’ll take you there for free,’ he persuaded. The gallery was in the direction I wanted to head anyway, so I agreed to the deal. I remembered the deal I’d made with myself to ‘just say okay’. I also remembered that I didn’t have a map and had no idea where any of these places were. So I took him up on his offer. It’s hard to argue that you can’t browse for two minutes when you have all the time in the world. So I browsed in a shop full of expensive Indian curiosities. We continued to see sights, but after a couple of hours my energy was flagging. We visited temples and palaces and museums. Sibin took me to an organic spice shop. ‘Sarah you don’t need to buy anything here. They will let you take photos of their spices.’ Because I am human I love taking photos of those big sacks of spices, so I jumped at the chance. Once I was in there, two beguiling young women began to sell spices to me. They were really good salespeople and the spices smelled amazing. I wasn’t confident about calculating the exchange rate yet, so when I came out of there with a big bag of spices and much less money in my wallet, I started to wonder whether ‘just saying okay’ was a good idea. Who goes out for the day without a map or a working knowledge of the currency? I insisted. It was time to go. On the way home, we pulled up in front of a shop. I was getting really tired of this. ‘Just two minutes, Sarah. JUST TWO MINUTES.’ In the shop I found some cute wall hangings that were reasonably priced after some light haggling. Now it was definitely time to go home. Who knows what I was capable of? What if I spent all of my money for the whole month on cute wall hangings and spices? I had spent all the money in my wallet, so when we got back to the homestay I had to run upstairs to get enough cash to pay Sibin. I stood there between my cool and calm homestay and Sibin’s auto rickshaw. I took a moment to think about it, and even though I wanted to take a nap, I just said okay. I met Sibin’s daughters, Sreya and Sredha, and his wife, who fed us fish curry. I also met Sibin’s grandmother, who was grieving the recent death of her husband. 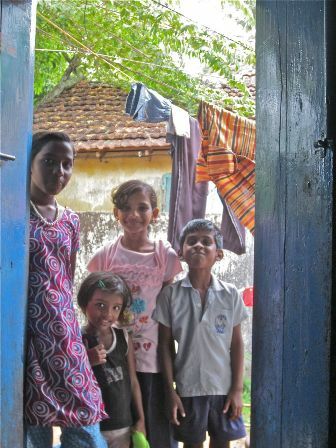 The kids in the neighbourhood took turns catching a glimpse of me through the door of Sibin’s house and then running away. They pushed forward Kevin who, Sibin informed me, spoke excellent English. ‘Hi Kevin!’ I said. ‘I am fine,’ he mumbled shyly. Another young boy delivered us some cool water from the kiosk. Sibin informed me that this boy’s father had recently died in a building collapse. Sibin’s eyes welled up. Sibin’s youngest daughter, an impossibly cute two year old stood face to face with me and just stared. She didn’t move. When Sibin and I started eating, he distracted her by offering her some fish. Then, proving that two year olds are two year olds wherever you find them, she demanded more fish from her dad by biting down hard on his forearm. Ahhh, all the good reasons to say ”okay”. THanks for the reminder. This entry was posted in Life and tagged 99 tips for a better world, life, travel. Bookmark the permalink.